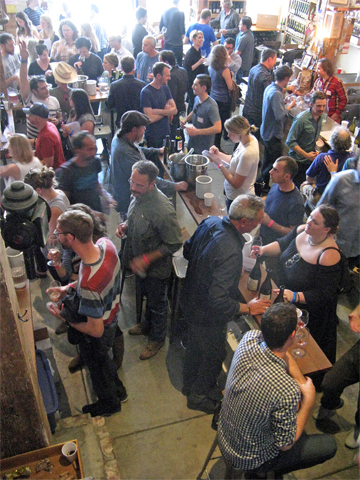 Report on the 2nd annual Califermentation wine tasting, held on Saturday November 12th and Sunday November 13th, 2016 at Terroir Natural Wine Bar and Merchant in San Francisco, California. The focus of the event is on natural wines from California. Califermentation was presented by The Vinguard (http://thevinguard.com/) and by Winelandia (https://winelandia.com/), and Terroir was able to utilize an adjacent gallery space to help accommodate the 20+ wineries that poured on each day of the event. There were different producers on hand each day, with nearly 50 participating in total. I was only able to attend the Saturday session of Califermentation, and spent a fair amount of time helping to pour there for Harrington Wines, where I work part-time. Although my time to get out from behind the table to taste other wines was limited, I did try some terrific bottlings and discovered a few producers that were new to me, so I wanted to put together a brief report on the highlight wines that I tasted. I should start out by noting the criteria for the Califermentation tasting. There is no strict definition of what constitutes natural wine, but Califermentation’s criteria are ones that most would agree upon: organically- or biodynamically-farmed grapes (though not necessarily certified), native yeast fermentations, no additions other than up to 50ppm of SO2 (no added water, acid, nutrients, enzymes, etc.). Comparing these criteria to those of another natural wine tasting I attended earlier this year – Brumaire – they’re similar though the allowable SO2 level in the wines was much more restrictive at Brumaire. The more lenient guidelines of Califermentation allowed a wider range of California producers to participate. Overall I felt the wines were more consistent at Califermentation (fewer wines I felt to be flawed), even though there were a number of very low- and no-added-SO2 wines on display there as well. The wineries pouring at Califermentation ranged from new and little-known producers to those who have been making wines that would be considered natural long before that became a widely-recognized category, such as Clos Saron, Coturri, and Frey. Nearly every corner of the state was represented by wines at this tasting, and there were a number of different wine styles on display as well – a fine overview of natural wines from California. Turnout at the tasting was great, at least on Saturday when I was there, and it was easy to feel the energy and enthusiasm of both producers and consumers. The side-by-side venues were packed, but it never took long to get up to a table for a pour. I had the chance to check out a number of wineries that were new to me, and my favorites among those were Amplify, Irene, and Vesper. There were several other producers whose wines I’d had very limited experience with, and Elizia, J. Brix, La Onda, and Purity were standouts there. And of course I made sure to stop at tables of wineries that were more familiar to me – favorites there included AmByth, Broc, Clos Saron, Forlorn Hope, La Clarine Farm, Lo-Fi, and Verdad. Califermentation was a fun event, with plenty of diversity among the wines being presented. I’ve always felt that there are quite a few more wines that fall under the natural umbrella than are generally recognized, since many producers choose not to push their wines as natural for a variety of reasons. Many make some wines that would be considered natural and others that would not, and these producers are often excluded in the natural wine conversation. A number of these wineries were represented at this tasting, and this more inclusive group made Califermentation a tasting unlike any other I’ve attended in the Bay Area – I certainly plan to be back next year. AmByth Estate’s 2012 “Adamo” red blend from Paso Robles (60% Grenache plus Mourvèdre, Syrah, and Counoise) was aged in a clay amphora, and had no added SO2. It featured bright red fruit, savory herbs, and plenty of zippy acidity – showing very nicely. Amplify Wine’s 2015 “Duke & Ella” is a blend of 80% Viognier and 20% Muscat from Santa Barbara County, made mostly in stainless steel. Floral aromas along with peach and pear notes, without being overly “Muscat-y”, and medium body with a long, lively finish. Broc Cellars poured a magnum of their 2015 Arrowhead Mountain Vineyard Zinfandel from Sonoma Valley, showcasing a single component of their “Vine Starr” Zin. This had an earthy, brambly character with darker fruit notes and dried herbs, and good structure for some cellar age. Clos Saron poured one of the most remarkable wines of the day with their magnum of 1995 “Once Upon a Time” Riesling from Renaissance Vineyard in the northern Sierra Foothills. A dry Riesling with a fairly mild but unmistakable petrol component along with citrus and stone fruit, a floral note, with great acidity leading to a long and lively finish, still youthful but developing beautifully. The 2013 “Stone Soup” Syrah was another standout with its minerally earth and raspberry character. Elizia Wine offered a preview of their 2014 “Méthode Ancestrale” Sparkling Rosé, made from Zinfandel, using a very small addition of fermenting 2015 juice to the 2014 base wine. Lightly sparkling, with bright and spicy raspberry fruit, earth, and a leesy note. Light and refreshing, serious and fun at the same time. Forlorn Hope Wines’ 2015 Estate Chenin Blanc, from Calaveras County displayed lime zest, a touch of stone fruit, and an intriguing chalky texture. I had tasted this wine a few months earlier and it was a bit closed then, but it’s really coming around. I enjoyed the 2015 “L’Asino Santo” Estate Barbera (with no added SO2) as well, for its cherry, earth, and herb notes and vibrant acidity. Irene Wine Cellars’ lone wine was the 2015 El Dorado Red Wine – 50% each Syrah and Mourvèdre, fermented entirely with whole clusters and aged in neutral oak. Slightly tart raspberry, plus earth and herbs in support, with a touch of stony minerals and fine tannins on the finish. J. Brix’ blend of about 50% each Carignan and Syrah has the somewhat cumbersome name of 2015 “(The Hornswoggle) Stay-in-Bed Red,” but there’s nothing cumbersome about this wine. Savory, earthy, herbal, with dark berry fruit plus hints of black olives, this had a bright, lively texture. Their 2015 “La Belle Rêveuse” Alamo Creek Vineyard Syrah was very good as well. La Clarine Farms’ 2015 Sumu Kaw Vineyard Syrah from El Dorado County was fermented with whole clusters, and showed distinctive black olive and herb aromas along with black fruits, earth, and a slight floral note. Medium weight on the palate with refined tannins. Their 2015 Tempranillo, co-fermented with about 5% Albariño, was also quite nice. La Onda poured a couple of good Cinsault-based blends, and my favorite was their 2015 Cinsault–Pais, about a 70% / 30% blend, from old-vine fruit sourced in Chile. Red fruit, earth, and savory herbs on the nose, and the Pais component was unmistakable and highly distinctive. Lo-Fi Wines’ standout was their 2015 Cabernet Franc from Coquelicot Vineyard in Santa Ynez Valley, made with semi-carbonic fermentation. Herbal and bright, with plummy fruit, earth, a lively texture and chalky tannins on the finish. Their 2015 Malbec, from the same vineyard, was also good. Purity Wines poured a very good 2014 Syrah sourced from Demetria Vineyard in Santa Ynez Valley. Herbs and black olives were upfront along with dark fruit, earth, and a saline note, with a bigger mouthfeel and firm tannins – good potential for some time in the cellar. The pre-release 2015 Mourvèdre, sourced from the northern Sierra Foothills, showed promise too. Verdad Wines’ 2014 Garnacha, from biodynamically-farmed Sawyer-Lindquist Vineyard in Edna Valley, includes about 10% Tempranillo and was aged in neutral oak. Intense fresh strawberry aromas along with earth and herbs, with good structure and moderate tannins. Their 2015 Albariño and 2014 Cabernet Sauvignon were also notable. Vesper Vineyards is one of the best-known producers from up-and-coming San Diego County. Their 2014 “Tie-Dye Lollipop” McCormick Ranch Grenache/Carignan blend, aged in neutral oak, was a fun wine, with light, fresh fruit flavors and earthy undertones.